Memorandum of Understanding on the Energy Sector Cooperation. 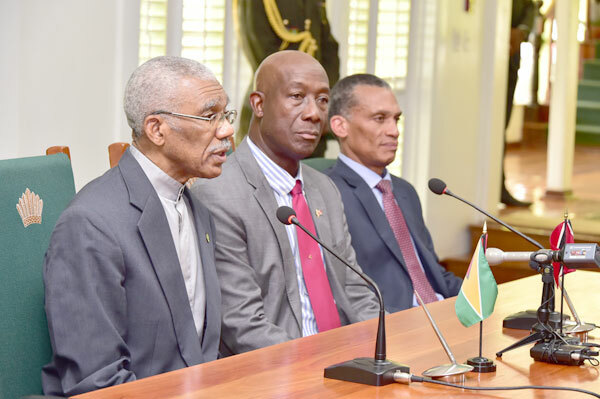 President David Granger yesterday insisted that an Energy Agreement with Trinidad and Tobago (T&T), a sister CARICOM state, is no sell-out. The Head of State gave this assurance at State House, shortly after the signing of the Memorandum of Understanding on the Energy Cooperation between the two states. T&T’s Prime Minister, Dr. Keith Rowley is leading a two-day visit here. The agreement comes as Guyana gets ready to start producing oil, in less the two years, thanks to one of the biggest oil finds in the last few years in this part of the hemisphere by US oil giant ExxonMobil. Several large companies have come knocking for a piece of the oil pie with a number of countries also assisting in lending technical expertise. The agreement in addition to technical expertise from T&T, would see collaboration in “the identification and development of projects throughout the hydrocarbon value chain; the identification of projects in the area of construction and maintenance of plants and infrastructure related to transportation, storage and supply of hydrocarbons and derivatives”. Prior to the MoU, the private sector has called for the MoU to be made public. There were also calls for T&T to pronounce on its stance on the Guyana’s border issue with Venezuela, which is currently engaging the attention of the International Court of Justice in The Hague. Rowley said that the Twin Island Republic has always backed Guyana in its bid to protect its border using the mechanisms. Speaking at a press conference held immediately after the signing of the MoU, President David Granger noted that the fears expressed by the private sector over a Trinidad take over, are unjustified and baseless. Rather, he said the private sector should be proud and pleased with the step that the two Governments have taken today. T&T, which has developed a strong manufacturing sector over the years thanks to the oil and gas sector, has been accused of muscling its products into the Guyana market without attempts to reciprocate. Guyanese have also been complaining bitterly of being benched often at the airport in Port of Spain by suspicious immigration officials with no explanation. However, Granger was upbeat about the agreement. Trinidad has been supplying oil to Guyana following the halt of shipments from Venezuela in 2015. However, with the impending closure of Petrotrin, T&T’s oil refinery in a few weeks time, Guyana is looking elsewhere for its supply to the Guyana Oil Company. “There is nothing in the MoU, which seeks to harm the interests of one State or the other. There is no sell out. There were some unjustified fears that Guyana is giving away the family jewels but that is not true. It is simply a means of collaborating. Trinidad is bringing years of experience not only in production but in marketing, in gas, in oil spills, in dealing with multinational corporations and the MoU is a means of benefiting from Trinidad and Tobago’s expertise and experience. So that fear of giving away is completely unjustified,” he said. Noting that the two states have enjoyed strong and cordial relations for a very long time, President Granger said that Guyana has always regarded Trinidad as a very close friend in the international arena. As Guyana embarks on the new oil and gas sector, the Head of State noted that Trinidad has the technical expertise and experience, which Guyana can benefit from. “We expect that as a result of this engagement today,relations between our two Republics will become stronger. Today’s meeting has been a clear redefinition and reassertion of our Caribbean identity. There is much that we have to learn from Trinidad and Tobago. Trinidad and Tobago is one of the most developed countries in the Caribbean in terms of its economy, manufacturing, exports, standard of living, education and Guyana is the largest CARICOM [Caribbean Community] state. 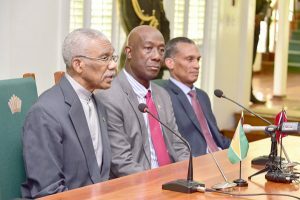 We have abundant raw materials, natural resources, gold, diamonds, timber, manganese, bauxite and we are confident that by collaborating, we will be able to combine the natural resources of Guyana with the entrepreneurial expertise, capital and investment from Trinidad and Tobago,” said President Granger. Meanwhile, Prime Minister Rowley, in his remarks, stated that Trinidad and Tobago has been and continues to be a gateway to the world for Guyana. Dr. Rowley noted that the signing represents the documentation of two countries’ commitment to do more in enabling relations with respect to the generation of economic and other kinds of cooperation to the benefit of the people of Guyana and Trinidad and Tobago. “We anticipate that the role of the Government in laying the groundwork and providing the encouragement for our private sectors to seize opportunities, which are available to both countries at this time, could only be a good thing for the people of Trinidad and Tobago and Guyana. We also mentioned, if not discussed in detail, the existence of invisible borders in our endeavours and where we should acknowledge their existence and to let our efforts identify the resources in each of our countries and to put those resources whether it be financial, raw material or entrepreneurial skills to work so as to grow the economy of Trinidad and Guyana. We are two groups of people with so much in common and so much history and so much common desire to advance ourselves that we should not be held back by the bureaucratic impediments,” the Prime Minister of Trinidad and Tobago stated. Dr. Rowley said it is the hope of both countries that the discussions and MoU will not sit idly by but would ensure that actions are taken and results are felt. “Ministers have spoken to their colleagues about what we are doing and what we can do to further cooperation in the various areas represented. We have had some very fruitful discussions and we look forward from moving away from talking about what should be done and what we should be doing and actually moving to the doing phase. It is my expectation that in the coming months and years ahead that our people can see more action in the areas of cooperation and development…we believe that what is good for Trinidad and Tobago in this business is also good for Guyana. We can only see positives if we collaborate…,” he noted. The signing of the MoU followed the bilateral meetings. Prime Minister Rowley was accompanied his Minister of Foreign and CARICOM Affairs, Senator Dennis Moses, Minister of Energy and Energy Industries, Senator Franklin Khan, Minister of Planning and Development, Mrs. Camille Robinson-Regis, Minister of Agriculture, Land and Fisheries, Senator Clarence Rambharat, Minister of Sport and Youth Affairs Ms. Shamfa Cudjoe. Guyana was represented by Minister of Foreign Affairs, Mr. Carl Greenidge, Minister of State, Joseph Harmon, Minister of Agriculture; Mr. Noel Holder, Minister of Business, Mr. Dominic Gaskin, Minister of Social Cohesion Dr. George Norton and Minister within the Ministry of Finance, Mr. Jaipaul Sharma. Also present was Dr. Mark Bynoe, Head of the Department of Energy. The visiting delegation departs today (September 20. 2018), for Trinidad.